I have paint in my hair and several scratches and bruises from bumping into boxes, but I'm back! We've planted grass in the front yard and rosemary and peppers in the back garden. All the common rooms are painted (trim, walls and ceilings) so I'm taking a break before starting the bedrooms. Last night we hung the dining room curtains and it feels like a real home now (albeit, a messy one). Now I have to stop ignoring my knitting because I have three birthday gifts due soon -- and a sock blank for swap. 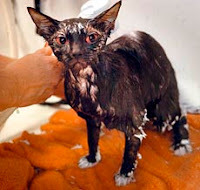 New news: We rescued a kitten who seems to be immune to KnottyKitty's horrific disease (and oddly tolerent of KnottyKitty's aggressive bath-giving). Pictures and writing coming soon.